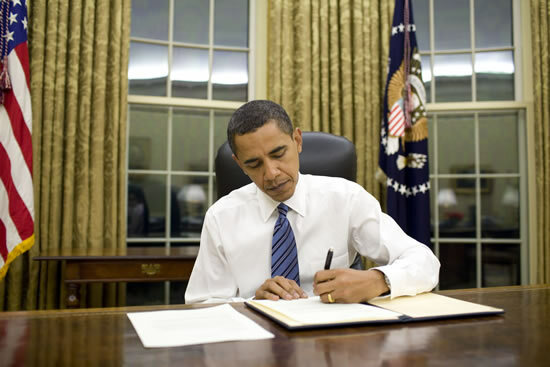 Obama Signs 923 Executive Orders in 40 Months !!! I’m sure you’ve all heard the tale of the “Frog in the Pot”… you all comfortable??? 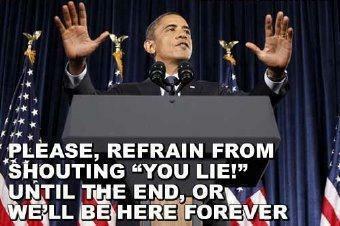 Watch Obama’s actions, not his words! By his actions he will show you where America is headed. When it comes to Barack Obama, one of the most important things to understand is that he is a committed globalist. He firmly believes that more “global governance” (the elite don’t like to use the term “global government”) will make the world a much better place. Throughout his time in the White House, Obama has consistently sought to strengthen international institutions such as the UN, the IMF, the World Bank and the WTO. At every turn, Obama has endeavored to more fully integrate America into the “global community”. Since he was elected, Obama has signed a whole host of new international economic agreements. He regularly speaks of the need for “cooperation” among global religions and he has hosted a wide variety of different religious celebrations at the White House. Obama once stated that “all nations must come together to build a stronger global regime”. If you do not want to live in a “global regime” that is just too bad. To globalists such as Obama, it is inevitable that the United States of America will be merged into the emerging global system. Just this week, Obama has issued a new executive order that seeks to “harmonize” U.S. economic regulations with the rest of the world. This new executive order is yet another incremental step that is pushing us closer to a North American Union and a one world economic system. Unfortunately, most Americans have absolutely no idea what is happening. The American people need to understand that Barack Obama is constantly looking for ways to integrate the United States more deeply with the rest of the world. The globalization of the world economy has accelerated under Obama, and this latest executive order represents a fundamental change in U.S. economic policy. Now federal regulators will be required to “harmonize” their work with the international community. The following is how this new executive order was assessed in a recent Businessweek article…. Members of the Obama administration are touting this as a way to “reduce regulation”, but the truth is that this is much more about aligning ourselves with the rest of the world than anything else. Obama’s “Information Czar”, Cass Sunstein, authored a piece in the Wall Street Journal on Monday in which he stressed the need to eliminate “unnecessary regulatory differences across nations” so that the United States can compete more effectively in our “interdependent global economy”. The end result of this process will be that we will now do things much more like how the rest of the world does things…. But a one world economic system is not going to arrive overnight. Initially, it is much more likely that there will be a very strong push toward North American integration first. The goal will be to shape North America into an integrated regional economic unit similar to the EU. Cass Sunstein discussed how this new executive order will affect North American integration on the White House website on Tuesday…. Last year, Barack Obama signed an agreement to create a “North American security perimeter” and most Americans never even heard about it because the mainstream news networks almost entirely ignored it. But this is exactly what the globalists want. They don’t want people to become alarmed by these moves toward North American integration. In fact, a document uncovered by Wikileaks shows that those involved in the effort to integrate North America believe that an “incremental” approach is best. Apparently they believe that small moves toward integration are less likely to alarm the general population. The following is from an article that appeared in The National Post last year…. A few years ago, the “Security and Prosperity Partnership Of North America” (SPP) that was being promoted by President George W. Bush started to generate quite a bit of negative publicity. That caused those seeking to integrate the economies of North America to back off for a little while. But as an article by Jerome Corsi last year detailed, the eventual goal is to turn North America into another version of the eurozone. That includes a common currency for North America called the “amero”…. So will we ever see the “amero” replace the U.S. dollar? If the globalists try to introduce the “amero”, it would probably be after a horrible financial crisis in which the U.S. dollar falls apart. The “amero” would be heralded as the “solution” to the problems that were plaguing the dollar. If there ever is a move to get rid of the U.S. dollar for an international currency of some kind, the American people will need to resist it with all of their might. Once our national sovereignty is gone, it will be incredibly difficult to get back. If the American people don’t take a stand while they still can, their children may wake up someday as citizens of a very oppressive “global regime”. (a) “Archivist” refers to the Archivist of the United States or his designee. (b) “NARA” refers to the National Archives and Records Administration. Sec. 2. Notice of Intent to Disclose Presidential Records. (a) When the Archivist provides notice to the incumbent and former Presidents of his intent to disclose Presidential records pursuant to section 1270.46 of the NARA regulations, the Archivist, using any guidelines provided by the incumbent and former Presidents, shall identify any specific materials, the disclosure of which he believes may raise a substantial question of executive privilege. However, nothing in this order is intended to affect the right of the incumbent or former Presidents to invoke executive privilege with respect to materials not identified by the Archivist. Copies of the notice for the incumbent President shall be delivered to the President (through the Counsel to the President) and the Attorney General (through the Assistant Attorney General for the Office of Legal Counsel). The copy of the notice for the former President shall be delivered to the former President or his designated representative. (b) Upon the passage of 30 days after receipt by the incumbent and former Presidents of a notice of intent to disclose Presidential records, the Archivist may disclose the records covered by the notice, unless during that time period the Archivist has received a claim of executive privilege by the incumbent or former President or the Archivist has been instructed by the incumbent President or his designee to extend the time period for a time certain and with reason for the extension of time provided in the notice. If a shorter period of time is required under the circumstances set forth in section 1270.44 of the NARA regulations, the Archivist shall so indicate in the notice. July 16, 2012 Daniel M. Parkman, Sr.
Executive Order 12667 – Issued by President Reagan in January 1989, this executive order established the procedures for NARA and former and incumbent Presidents to implement the PRA. Executive Order 13233 – This executive order, issued by President George W. Bush on November 1, 2001, supersedes the previous executive order. The Bush executive order also includes the documents of former Vice Presidents. Executive Order 13489 – Issued by President Barack Obama on January 21, 2009, restored the implementation of the PRA of 1978 as practiced under President Reagan’s Executive Order 12667 and revoked President Bush’s Executive Order 13233. « ROMNEY V OBAMA ?? ?